The Internet was rattled after Snapchat released their newest policy changes causing rumors to circulate that its changes now allow for the company to use people’s content as they see fit. But recently, Snapchat released a statement on their Tumblr page to clarify any confusion about the policy update. New York City’s Pro Era, led by front man Joey Bada$$, has directed their recent spotlight to the release of Kirk Knight’s debut project Late Knight Special. Kirk Knight, has been one of the group’s main producers throughout their development and has stood out among the various group members as a talented emcee, breaking the hip-hop stereotype that producers can’t rap. I have been following multiple members off the Pro Era roster through their social media accounts, with a focus on their Instagram accounts and I have noticed a recurring trend within their postings. Whenever one of the members is working on their latest project, all of the members take to their social media and promote their peers’ material, such was the case during Kirk Knight’s process of working on his debut album. For a genre of music such as hip-hop, where competition is fierce and proving yourself through your craft is essential, these young emcees have harvested a strong sense of comradery, which is a wonderful thing to see in a genre of music with a history of harsh critiques and violent competition. During Monday Night Football’s halftime, the heavily anticipated full-length trailer for Star Wars: The Force Awakens was revealed, causing a stir on the Internet and getting fans riled up for the seventh installment in the legendary series. Being a huge Star Wars fan myself, I took to the internet soon after I watched the trailer during halftime of the Giants vs. Eagles game. I was curious to see other people’s perspectives on the trailer and what fan theories people already created. As I spent some time scrolling down the YouTube comments for the trailer, many fans already began asking questions, such as, “Where is Luke?” or “Who is Kylo Ren?” Some fans even theorized as to whether or not classic characters such as Han Solo would be killed off or not. The overwhelmingly positive response to the trailer was apparent throughout much of the comment section. Aside from theories, what we know thus far is that the main characters appear to be Rey and Finn because of the extended screen time they received during the two and a half minute trailer. Rey, played by Daisy Ridley, appears to be a wanderer of the dessert planet, Jaku. When a woman’s voice asks her who she is, Rey proclaims “I’m no one.” However, this does not seem to be the case as she is the focus of the trailer. 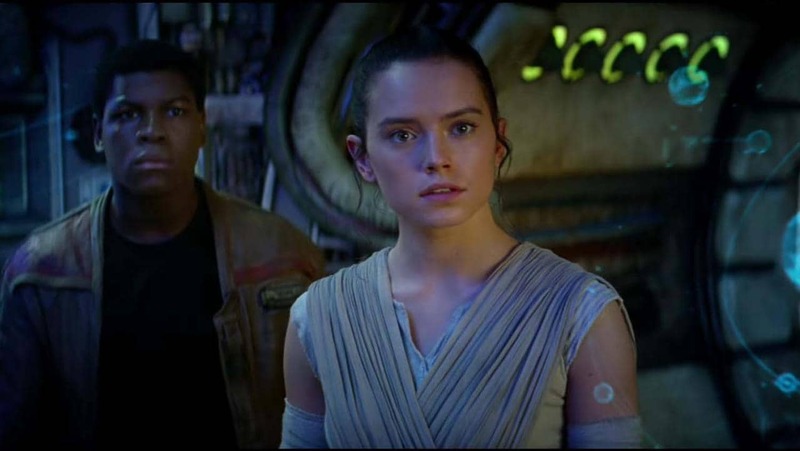 The other prominent face seen throughout the trailer is Finn, played by John Boyega. Finn appears to be a soldier who has deserted the Empire and has “nothing to fight for.” It seems he will be a primary character in the movie because he is seen wielding a blue lightsaber, signifying him to be a Jedi Knight (who is possibly still in training). Since the creation of social media, our generation has taken to computers and other devices across the world to express their opinions and emotions. These expressions may be on a number of things such as political issues, social discussions or entertainment, Regardless of the topic, these comments have affected the way we view social media and the Internet as a whole, for good and bad. As a heavy user of social media in its many forms, I know how crazy of a place the comment section of any video, article or photo can be. However, I have only recently started to appreciate the power of comments. We live in the age of social media where most of our generation stays in the loop of whats going on around us through Twitter, YouTube, Instagram, etc. However, the comment section tends to be overlooked, but if you take the time to read through the comments of any video on YouTube or Facebook, for example, you may find it even more intriguing than the content itself. The Force is strong in my family…My Father has it…I have it…My sister has it…..You have that power too. The opening words to the second trailer for the upcoming seventh installment within the Star Wars series is spoken by Luke Skywalker, played by Mark Hamill, and it brought a giant smile to my face, almost moving me to joyous tears. The first four phrases before the very last, “you have that power too,” signaled to anyone who has kept up with all six of the movies that Luke is speaking to another force user. An Escape: Can a Video Game be More than a Game? Last night, I traversed the brick streets of a dimly lit town, the sound of blood-curdling screams filled the air and it was hard to concentrate, especially when werewolves were strolling up and down the bridge that a weary traveler, like myself, had to make it past. I managed to cut down the rabid beasts and explore further down the Gothic looking buildings, past many lamp posts, discovering a hillside where I spotted burning humanoid beasts on crosses. Along this trail there was an old church. I ventured into the church and found a creature known as the “blood-starved beast.” I fought it, and I died. On the other side of the screen, was me: eyes wide, mouth open, extremely stumped. This was my fourth attempt at fighting said monster, but I still couldn’t get enough of this punishing, yet enthralling video game called Bloodborne. “What Happened and What’s Going On” strengthened, yet again, my ideology about the The Walking Dead. This episode displayed that the content and thematic elements within the show do not revolve around zombies or graphic violence, but about the human condition. It is a time of mourning among the remaining members of Rick’s group. The recent loss of Beth and Tyrese has taken a severe toll on the entire group, especially for Maggie, Daryl and Sasha, which has caused a shortage in morale. As we continue to hold back tears for the sudden death of one of the show’s most likeable characters, Beth, we look onward to the uncertain future of the remaining group of survivors. The death of Beth has taken a major toll on the morality of Rick’s group, and the opening scenes of the midseason premiere serve to remind us how the struggles of moving on, which range from burying the fallen to scavenging for scarcer and scarcer supplies, are intertwined in the harsh, apocalyptic environment that never grows easier for one to adapt to. Often, whenever I talk about TV shows with someone and I mention AMC’s The Walking Dead, the first thing they’ll say is “Oh, that show about zombies?” The problem with this response is that there is much more to this show than just “zombies.” I do acknowledge the fact that The Walking Dead has to do with the zombie apocalypse, but for those of you that thought this show was simply about a group of humans fighting the undead, then the season 5 premiere will show you how the recurring theme of the human condition and family plays an integral part in the unfolding of the series.